David dead sea resort & spa is among the most luxurious and exclusive of the Dead Sea hotels. It is characterzed as a spa and conference hotel that integrates a unique atmosphere of tranquility and entertainment. The hotel has an extraordinary spa with treatment rooms, sulfur pool, gym, and saunas. Our guests will also enjoy The Bazar Dining Room, restaurants, pools, recreational facilities, and large convention halls. The hotel atmosphere has a relaxing ambiance: A performing artist in the lobby followed by night club style music and a main show in the ballroom. The pool area has a relaxing and calm atmosphere. Activities for children will be held in the Children’s Club and special activities for teenagers on the weekends. Any room reservation may be cancelled with no extra charges up to 48 hours prior to date of arrival. Any cancellation made less than 48 hours prior to date of arrival will be charged at the price of one night per every reserved room, according to the type of board ordered. During August , any reservation may be canceled with no extra charges up to 7 days prior to date of arrival. Any cancellation made less than 7 days prior to date of arrival will be charged by the full price, subject exclusively to the hotel management's judgment. 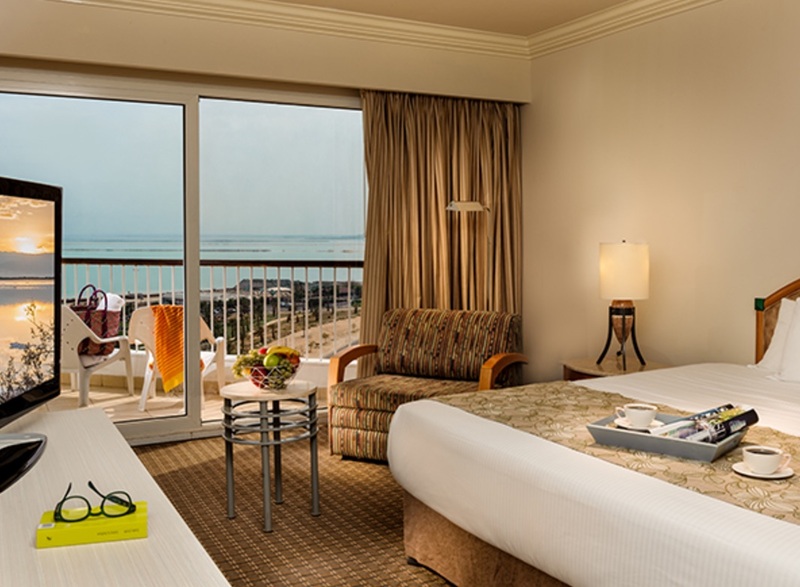 In case of non-arrival after reservations are made, David dead sea hotel reserves the right to charge the purchaser for the full and/or partial cost, subject exclusively to the hotel management's judgment. Presidential SuiteA luxurious, impressive and exceptionally spacious suite, richly equipped that offers an assortment of personal pampering items: exclusive check-in,A designated parking area (based on availability) bathrobes and slippers, bathrobes and slippers, daily newspaper and upgraded breakfast at “Olives”. The Suite Includes: Bedroom, Dining area, Panoramic terrace, Bathroom with a Jacuzzi, Guest bathroom with shower stall, Spacious living room. 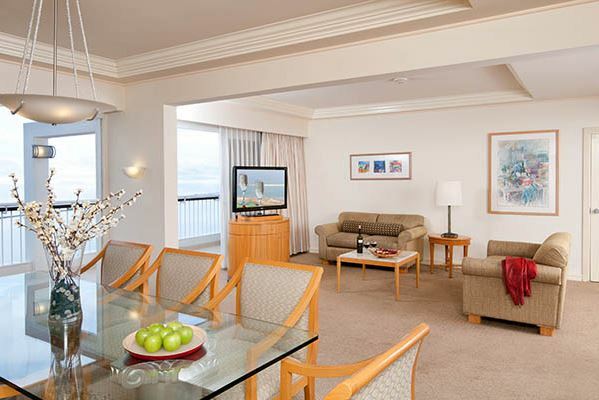 Royal SuiteA luxurious suite located on the 17th floor. The Suite includes an exceptionally spacious bedroom and living area, a walk-in closet, home theater, dining area, bathroom with a Jacuzzi, panoramic terrace and sun-bathing terrace. Personal pampering items include:exclusive check-in,A designated parking area (based on availability) bathrobes and slippers, daily newspaper, and a free entrance to our luxuries business lounge and spa. 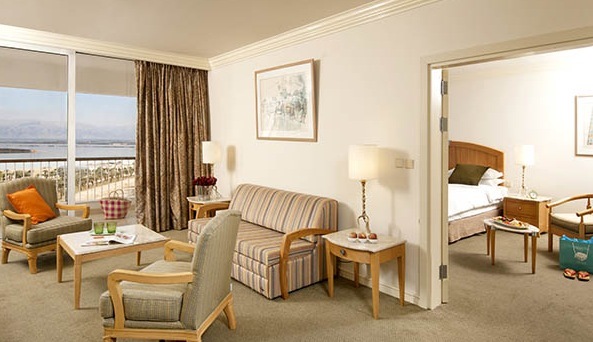 David SuiteA luxurious, royal suite richly equipped for the most exclusive hospitality at the Dead Sea. Pampering items for our guests include:Exclusive check-in, A designated parking area (based on availability), bathrobes and slippers,daily newspapers. Presidential Suite Includes: Bedroom, Dining area, Panoramic terrace, Spacious living room, Walk-in closet, Sun-bathing terrace, Kitchenette, Jacuzzi and a coffee and tea kit. Superior Premium Pool ViewRoom located at the 14th-17th floors with a pool view. Includes double bed or twin beds, bathroom and shower, T.V., mini bar, coffee and tea kit, safe, and balcony.Premium room offers you a variety of treatments:A designated parking area (based on availability), a bathroom robe and cozy sleepers,chocolate and a bottle of mineral water,a free entrance to our luxuries spa and 15% discount on all treatments. Deluxe Premium SuiteThe Deluxe Premium Suite is your chez vous, offering the most pleasurable and home-designed suite at our hotel, with two dedicated balcony facing the Dead Sea view, a luxurious bathroom, large living Offering the most pleasurable and home-designed suite at our hotel, with two dedicated balcony facing the Dead Sea view, a luxurious bathroom, large living room with a separating door, two television sets, and everything required to make your vacation as pleasurable as possible. To ensure that the Deluxe Premium Suite will be available on your vacation, please schedule your vacation right now. 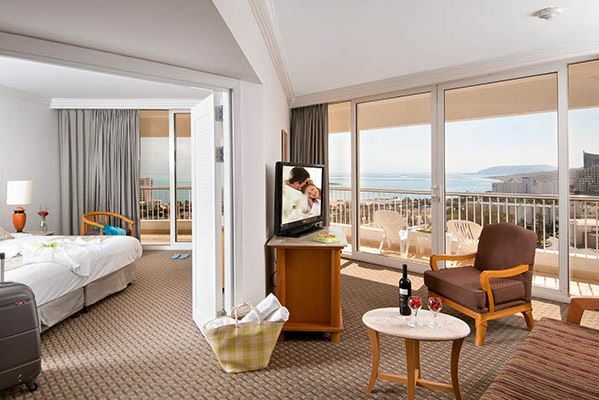 Masada Premium Suite With Pool ViewBook a luxurious dream vacation in the most prestigious suite in the Dead Sea area! The Masada Premium Suite was designed for your absolute comfort, with wide balconies, stylish bathroom, wide living room with a separating door, two television sets, sofa bed, mini bar, tea and coffee set and a safe. The Masada Premium Suite offers you the supreme vacation experience, and it is suggested to schedule your vacation as early as possible. The Suite faces the Dead sea and the pool. 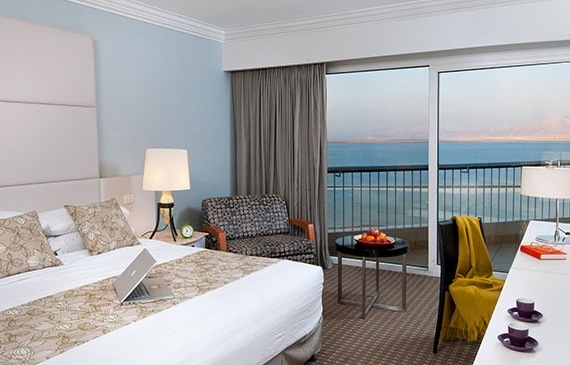 Masada Premium SuiteBook a luxurious dream vacation in the most prestigious suite in the Dead Sea area! 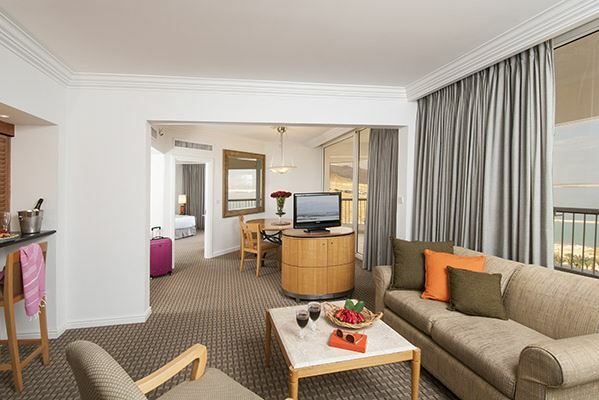 The Masada Premium Suite was designed for your absolute comfort, with wide balconies, stylish bathroom, wide living room with a separating door, two television sets, sofa bed, mini bar, tea and coffee set and a safe. The Masada Premium Suite offers you the supreme vacation experience, and it is suggested to schedule your vacation as early as possible. Deluxe SuiteThe Deluxe Suite is your pied-à-terre, the most pleasurable and meticulously-designed suite our establishment has to offer. 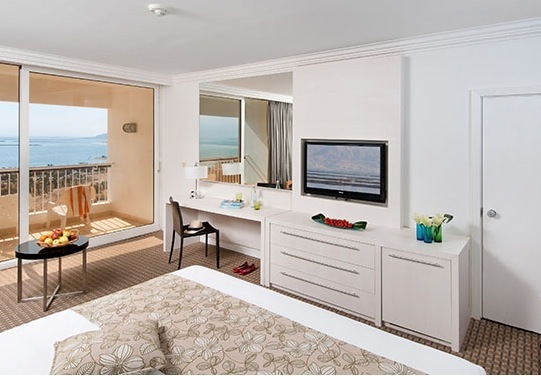 These rooms are styled to suit a family of four, with two dedicated balconies facing the Dead Sea, a luxurious and well-appointed bathroom, large living room with a separating door, two television sets, and everything necessary to make your vacation as pleasurable as possible. To ensure that the Deluxe Suite will be available for your vacation, please schedule your vacation right now. Superior PremiumThe Superior Premium rooms are spacious and well-appointed and are located on the 14th to the 17th floors of the hotel. These fabulous rooms include a dedicated sun terrace facing the Dead Sea, with a bathtub and a shower, television, mini bar, tea and coffee set, and a safe. 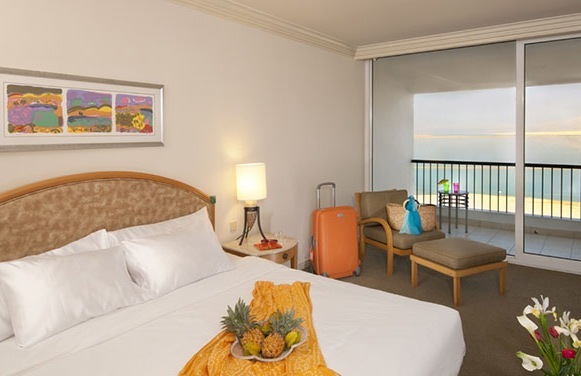 For your ultimate vacation experience, order a Superior Premium Room today. Deluxe PremiumSituated on the 14th to the 17th floors of the hotel, the Deluxe Premium rooms are large and spacious and are designed to ensure that you and your family’s vacation would be an unforgettable one These rooms are styled to meet the needs of a family of four, with capacious rooms, a dedicated balcony facing the Dead Sea view, and are fully fitted with bathtub and shower, television, mini bar, tea and coffee set, and safe. If you are looking for the best vacation location, you’ve come to the right place! Masada Suite With Pool ViewA sumptuous dream vacation in the most prestigious suite in the Dead Sea area! The Masada Suite was designed for your absolute comfort and satisfaction, with a wide balcony facing the Dead Sea and the pool, magnificent terraces, stylish, fully-equipped bathroom, spacious living room with a communicating door, two television sets, sofa bed, mini bar, tea and coffee set and a safe. The Masada Suite offers you an exceptional vacation experience, and we recommend you schedule your vacation as early as possible. 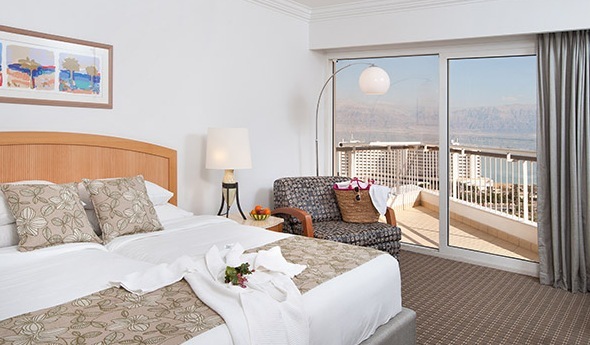 Masada SuiteA sumptuous dream vacation in the most prestigious suite in the Dead Sea area! The Masada Suite was designed for your absolute comfort and satisfaction, with a wide balcony facing the Dead Sea, magnificent terraces, stylish, fully-equipped bathroom, spacious living room with a communicating door, two television sets, sofa bed, mini bar, tea and coffee set and a safe. The Masada Suite offers you an exceptional vacation experience, and we recommend you schedule your vacation as early as possible. Garden Rooms With Pool viewThe garden rooms provide our guests with a fresh, natural atmosphere and maximum relaxation, the way that a true vacation should feel. 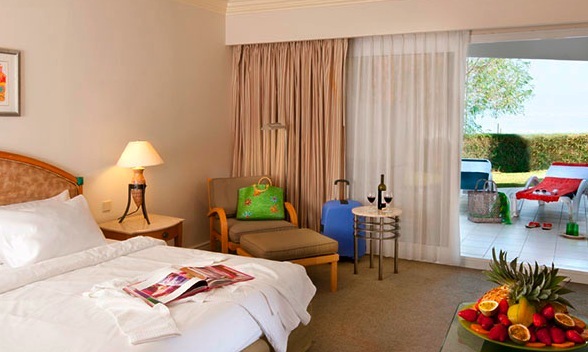 These are luxuriously-designed rooms that open out onto a beautiful garden and a view overlooking the pool. They have a comfortable bedroom, bathtub and shower, a television set, mini bar, and a tea and coffee set. For this wonderful vacation offer, book a room today at these attractive prices!